The Facts Presidents Andrew Johnson and Bill Clinton were impeached by the U.S. House of Representatives, but acquitted by the Senate. Richard Nixon resigned before he could be impeached. The right to impeach public officials is secured by the U.S. Constitution in Article I, Sections 2 and 3, which discuss the procedure, and in Article II, Section 4, which indicates the grounds for impeachment: "the President, Vice President, and all civil officers of the United States shall be removed from office on impeachment for, and conviction of, treason, bribery, or other high crimes and misdemeanors." Removing an official from office requires two steps: (1) a formal accusation, or impeachment, by the House of Representatives, and (2) a trial and conviction by the Senate. Impeachment requires a majority vote of the House; conviction is more difficult, requiring a two-thirds vote by the Senate. The vice president presides over the Senate proceedings in the case of all officials except the president, whose trial is presided over by the chief justice of the Supreme Court. This is because the vice president can hardly be considered a disinterested party—if his or her boss is forced out of office he or she is next in line for the top job! What Are "High Crimes and Misdemeanors?" Bribery, perjury, and treason are among the least ambiguous reasons meriting impeachment, but the ocean of wrongdoing encompassed by the Constitution's stipulation of "high crimes and misdemeanors" is vast. Abuse of power and serious misconduct in office fit this category, but one act that is definitely not grounds for impeachment is partisan discord. Several impeachment cases have confused political animosity with genuine crimes. Since Congress, the vortex of partisanship, is responsible for indicting, trying, and convicting public officials, it is necessary for the legislative branch to temporarily cast aside its factional nature and adopt a judicial role. The Infamous Sixteen Since 1797 the House of Representatives has impeached sixteen federal officials. These include two presidents, a cabinet member, a senator, a justice of the Supreme Court, and eleven federal judges. Of those, the Senate has convicted and removed seven, all of them judges. Not included in this list are the office holders who have resigned rather than face impeachment, most notably, President Richard M. Nixon. The Small Fry The first official impeached in this country was Senator William Blount of Tennessee for a plot to help the British seize Louisiana and Florida from Spain in 1797. The Senate dismissed the charges on Jan. 14, 1799, determining that it had no jurisdiction over its own members. The Senate and the House do, however, have the right to discipline their members, and the Senate expelled Blount the day after his impeachment. Judge John Pickering of New Hampshire was the first impeached official actually convicted. He was found guilty of drunkenness and unlawful rulings, on March 12, 1804, and was believed to have been insane. Associate Justice Samuel Chase, a strong Federalist, was impeached but acquitted of judicial bias against anti-Federalists. The acquittal on March 1, 1805, established that political differences were not grounds for impeachment. Other officials impeached were implicated in bribery, cheating on income tax, perjury, and treason. The Big Fish Two U.S. presidents have been impeached: Andrew Johnson, the seventeenth chief executive, and William J. Clinton, the forty-second. Johnson, a Southern Democrat who became president after Lincoln's assassination, supported a mild policy of Reconstruction after the Civil War. The Radical Republicans in Congress were furious at his leniency toward ex-Confederates and obvious lack of concern for ex-slaves, demonstrated by his veto of civil rights bills and opposition to the Fourteenth Amendment. To protect Radical Republicans in Johnson's administration and diminish the strength of the president, Congress passed the Tenure of Office Act in 1867, which prohibited the president from dismissing office holders without the Senate's approval. A defiant Johnson tested the constitutionality of the Act by attempting to oust Secretary of War Edwin M. Stanton. His violation of the Act became the basis for impeachment in 1868. But the Senate was one vote short of the two-thirds majority needed to convict, and Johnson was acquitted May 26, 1868. Senator Charles Sumner, witness to the proceedings, defined them as "political in character." Historians today generally agree with his assessment and consider the grounds for Johnson's impeachment flimsy—the Tenure of Office Act was partially repealed in 1887,and then declared unconstitutional in 1926. Bill Clinton was ultimately dragged down—though not defeated—by the character issues brought into question even before his election. An investigation into some suspect real estate dealings in which Clinton was involved prior to his presidency failed to turn up any implicating evidence. However, Independent Counsel Kenneth Starr managed to unravel a tangled web of alleged sexual advances and affairs in Clinton's past. The trail led to former White House intern Monica S. Lewinsky. After months of denials, including in a videotaped legal testimony, Clinton admitted in August of 1998 that he had had a sexual relationship with the young woman during the time of her internship. The infamous "Starr Report" outlining the findings of the Independent Counsel's investigation was delivered to the House of Representatives on Sept. 9, 1998, and subsequently made available to the public. Many felt the report, filled with lurid details of Clinton's sexual encounters with Lewinsky, to be a political attack against the President rather than a legal justification for his impeachment. Of the 11 possible grounds for impeachment cited by Starr, four were eventually approved by the House Judiciary Committee: grand jury perjury, civil suit perjury, obstruction of justice, and abuse of power. On December 19, following much debate over the constitutionality of the proceedings and whether or not Clinton could be punished by censure rather than impeachment, the House of Representatives held its historic vote. 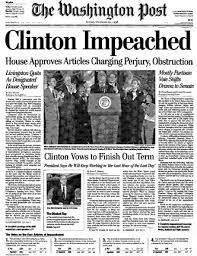 Clinton was impeached on two counts, grand jury perjury (228–206) and obstruction of justice (221–212), with the votes split along party lines. The Senate Republicans, however, were unable to gather enough support to achieve the two-thirds majority required for his conviction. On Feb. 12, 1999, the Senate acquitted President Clinton on both counts. The perjury charge failed by a vote of 55–45, with 10 Republicans voting against impeachment along with all 45 Democrats. The obstruction of justice vote was 50–50, with 5 Republicans breaking ranks to vote against impeachment. The One That Got Away Of thirty-five attempts at impeachment, only nine have come to trial. Because it cripples Congress with a lengthy trial, impeachment is infrequent. Many officials, seeing the writing on the wall, resign rather than face the ignominy of a public trial. The most famous of these cases is of course that of President Richard Nixon, a Republican. After five men hired by Nixon's reelection committee were caught burglarizing Democratic party headquarters at the Watergate Complex on June 17, 1972, President Nixon's subsequent behavior—his cover-up of the burglary and refusal to turn over evidence—led the House Judiciary Committee to issue three articles of impeachment on July 30, 1974. The document also indicted Nixon for illegal wiretapping, misuse of the CIA, perjury, bribery, obstruction of justice, and other abuses of executive power. "In all of this," the Articles of Impeachment summarize, "Richard M. Nixon has acted in a manner contrary to his trust as president and subversive of constitutional government, to the great prejudice of the cause of law and justice, and to the manifest injury of the people of the United States." Impeachment appeared inevitable, and Nixon resigned on Aug. 9, 1974. The Articles of Impeachment, which can be viewed at http://watergate.info/, leave no doubt that these charges qualify as "high crimes and misdemeanors," justifying impeachment.